Thorn is an Exotic Hand Cannon. It can only be acquired by by completing its Exotic Bounty. The good: Highest hand cannon rate of fire, very fast reload time, DoT. The bad: Kinetic damage, low Impact. 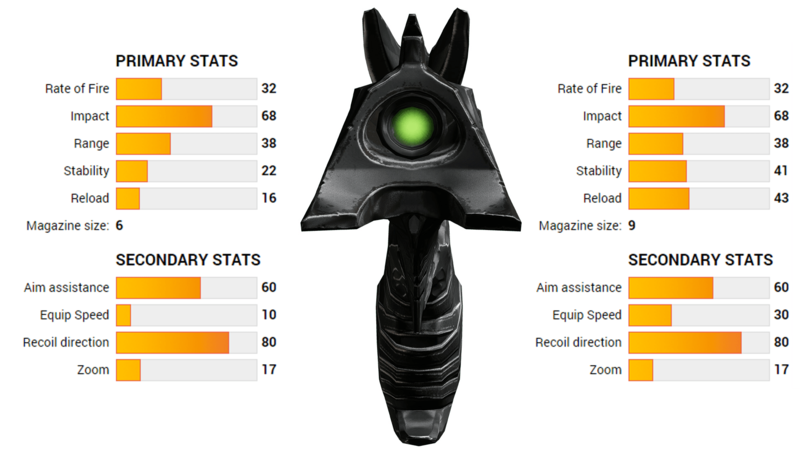 Conclusion: Fun to use, dominates in PvP. The last shot in your magazine deals 33% additional damage. +30% Aim Down Sight speed. Rounds pierce targets and cause lingering damage over time. Complete “The Summoning Pits” Strike on the Moon for the Depleted Hand Cannon. Then, harvest the energies of Hive on the Moon to activate the weapon by killing 500 Hive. Killing Majors or Ultras will count for more than “1” kill. After you do that, you’ll have an updated Depleted Hand Cannon. Use Void Damage to defeat Guardians in the Crucible. Death will slow your progress. 500 points needed, each kill will count for 5 points. Your deaths subtract 2 points. Once you complete this you’ll obtain the Corrupted Hand Cannon. Cleanse the weapon, by buying an Infusion of Light from the Speaker. Now bring the weapon to Ikora Rey. She gives you the Corrupted Thorn, and wants you to kill Xyor, the Unwed. Fight up to Phogoth. Clear all of the adds and ignore Phogoth. Killing Xyor will reward you with the Unbound Thorn. Return to the Speaker for your final reward, Thorn. With the recent update to Thorn, it absolutely needed to be reviewed again! The A “Light in the Dark” bounty, which you can read above, is actually worth doing now. Thorn’s signature ability is a damage over time (DoT) that is applied the first time you hit a target. This is amazing in PvP, but even more so now in PvE. If you can land precision shots, then most of your enemies will simply die in 1 hit. The DoT from Mark of the Devourer – which now hits a tier 1 enemy for 86 & tier 2 for 72, is great for keeping enemies shields down while you reload or run for cover. In addition, this perk also causes the rounds to over-penetrate the target. The stability is now above average, and makes the weapon easier to use in the closer ranges. The increase to the magazine size/ammo capacity, to a respectable 9, means you can be a little bit more free with your shots. Overall, the updates to Thorn have improved it to the point of being potentially one of the best PvP weapons in the game. With so many improvements, there’s isn’t much that it can be docked for. The main issue could be chalked up to its range and Impact. Thorn’s range isn’t great, but its Impact is the worst in the game as far as hand cannons go. The weapon would be even better if it had a damage type, so that it could be more viable in PvE, but with the massive DoT damage, it’s not that big of an issue. Unfortunately that DoT is the final unique perk, and is what makes Thorn useful in PvE, so you’ll definitely want to upgrade that. Thorn has a very iconic look and sound. You will immediately know if someone has it based on the distinct sound it makes. The weapon’s iron sight is also a somewhat difficult to see in brighter areas of the world. Augmented through dark practices, Thorn was once a hero’s weapon. Its jagged frame hints at a sinister truth: a powerful connection to the unutterable sorceries of the Hive. 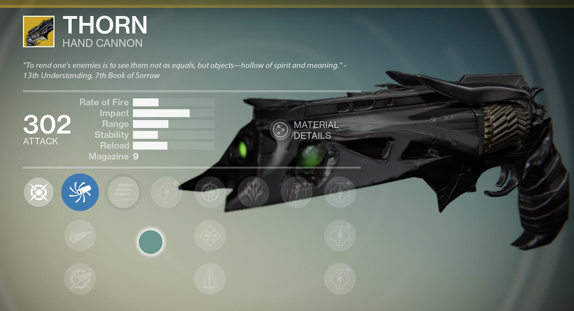 It’s now one of the Top 5 Exotics for PvP, and much more formidable in PvE than it was before the patch. In some circumstances it could be considered better than Hawkmoon, and easily better than The Last Word in PvE. Complete the Exotic Bounty, and level it up fully (after purchasing the updated version from Xûr), it’s worth it. For PvP this weapon earns a 10/10 and for PvE a 8.5/10. Next Post:New Crucible Gameplay, Hotfix, Raid Talk!